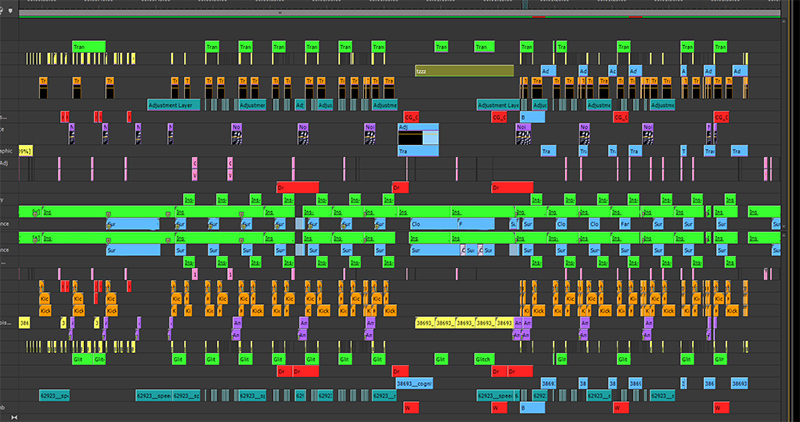 Here’s our Premiere Pro CS6 A/V timeline from our video-music piece for Videodrome 2013, minus a handful of nested tracks. This is our first project since we made the switch from Final Cut 7 to Premiere, which was simultaneously a pleasing and infuriating experience. We made the switch because we preferred the option of working on both Mac and PC, and FCPX is pretty good (once you get use to it) — but has a bit of a ways to go and doesn’t seem like it would be the most suited for the video-music style of editing. That being said, Premiere is also is pretty good, but also has a ways to go. The more efficient rendering over FCP7 resulted in less caffeine breaks, and Premiere’s adjustment layer tracks are an awesome feature because they allow you to manipulate multiple tracks at once. However, importing projects from one computer to another, especially given that they’re different operating systems, is not graceful in Premiere (duplicating all references to files in the project browser?!?! Really?!?! And no automatic file reference finder?!? ASDF?!?!). This is also the first project where we exported the audio cuts from a video editor into Ableton Live 9 for some additional processing/mixing/cleanup. Ableton Live is a dream to use. It’s a strange time because between FCPX and Premiere (which is grabbing the old Final Cut market), it feels that both programs aren’t quite right for the video-music style of editing (not that FCP 7 was exactly perfect to begin with). The one complaint with Premiere is that there are certain aspects to the workflow that feel a bit roundabout and are lacking straightforward shortcuts for simple tasks that are executed often. If only there was a video editing program with the creative ease of Ableton Live (perhaps there is one that we’re oblivious to?). Working with Ableton Live feels so malleable, direct, and fun. However, from some experience using VJ software (not that there’s a whole lot of experience, so once again maybe we overlooked something), we have yet to encounter something that’s a solid video editing/performance hybrid that has the immediate tactility that Ableton Live provides. For example, Ableton Live can do classical track based editing/producing, which has been a fairly standard approach for many audio programs as well as non-linear editing software, but it can also easily switch to one of the better sequencing/performance modes. One of the good things about this with regards to workflow is that any of the preliminary edits and organizational tasks are very easy to integrate with extended processing/manipulation of the media – you don’t have to pre-edit in one software, splice everything up, then bring it into an entirely different program to sequence it in a musical way (i.e., mapping it to MIDI, or arranging it on a timeline that works in beats/bars rather than frames-per second), and can be pre-composed to avoid the computer performance issues that happen with extensive real-time processing. I don’t do much video editing in Ableton, but this has me intrigued.